Let's face it, we all need a break from studying and researching and writing and... well, you get the point I'm sure. Besides... I admit it, I really enjoy medieval games. They are great fun and often you can actually learn some stuff during the course of playing. So, I made this page to share some my favorite medieval games with you. I hope you enjoy these as much as I do. The next time you are bored and have nothing else you *should* be doing... please try out one (or more) of these games. Think of games as your reward for a good honest day's work. You have two choices now. 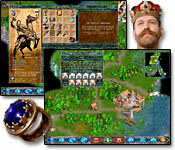 You can either click on the text link (awesome games) below to check out tons of awesome games or you can click on one of the pictures below to learn more about each medieval game I have featured below. Okay, are you ready? Check out these awesome games now. 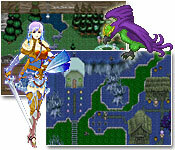 Please note: Clicking on the pictures below will open the game information in a new window. You will need to turn your pop-up blocker off. Here, in no particular order, are some of my favorite medieval games. 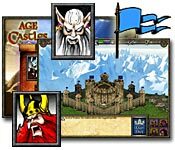 Check out Age of Castles now! 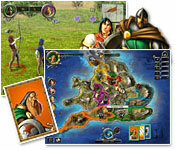 Check out Defender of the Crown now! Check out Discord Times now! 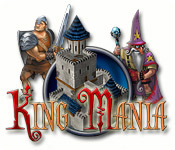 Check out King Mania now!